Biggest Slide in the Country! Warning: This slide is 29' High. We could not make it any bigger for your appreciation in this graphic, nor a perfect picture to show you how big it is could be taken. Description: Want the BIGGEST slide in the country? Race your friends on this gigantic slide. There is no comparision... this is it! You will start with a 29-foot drop with a 31-foot slide through a spraying rock tunnel. 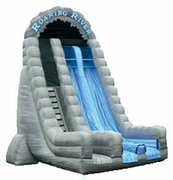 The Roaring Rapids Slide Combo is a very entertaining water slide rental. Experience the thrill of riding the rapids down this wet mountain of fun. Riders shoot down individual sliding lanes where they encounter the thrill of a bump in the rapids before they enter the tunnel and make a soft landing.